Learn about direct deposit at UC San Diego, the most environmentally friendly way to receive your financial aid and payment refunds. Direct deposit is a banking term used to refer to certain systems used to transfer money; it's a method of payment which electronically credits your checking or savings account. UC San Diego strongly encourages you to set up a direct bank deposit account. It's the fastest, most secure, and environmentally friendly way to receive your financial aid and refunds. Use the Direct Deposit tool. You must specify one U.S. personal checking or savings account as your direct bank deposit account (no joint accounts). Before enrolling in direct deposit, you must have a paper check to obtain the routing and checking account number (see illustration below). If you don't have a check or the routing and checking account number, contact your banking institution for this information. 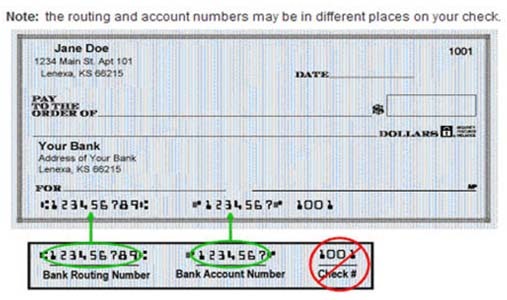 Use the routing and savings account number indicated by your banking institution (this may be found on your deposit slip in a similar location to the check illustration below). If you don't have the routing and savings account number, please contact your banking institution for this information. Note: The University will not use your direct deposit information to auto-debit from your account. It may take up to 15 business days to verify your direct deposit account. If a refund was already generated to your closed direct deposit account, Student Financial Solutions will generate a paper check once the funds return from the bank, and will send it to the current mailing address on file.